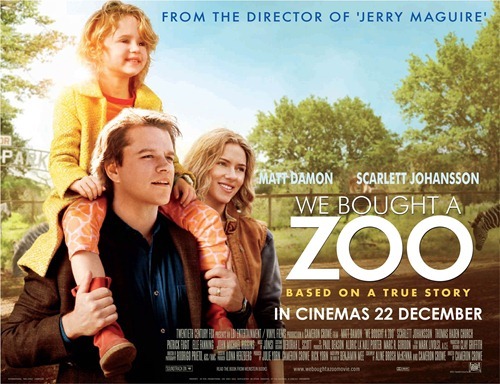 “We Bought a Zoo” is a comedy/drama from director Cameron Crowe that’s based on the memoir of Benjamin Mee. It’s packaged as a family movie that tells the interesting true story of Mee and his purchase of a run-down zoo. “We Bought a Zoo” does sometimes tug at the proverbial heartstrings and there are occasional moments where the film is mildly amusing. But it’s also a movie that’s full of forced sentiment and familiar themes that play out exactly as they have in other films. Matt Damon plays Benjamin Mee, a recent widower still struggling with the recent death of his wife. He has two kids, both fitting the molds of so many others we’ve seen. There’s his adorable 7-year old daughter Rosie (Maggie Elizabeth Jones) who is filled with cute smiles and cuter sayings. Then there is 14-year old Dylan (Colin Ford), the misunderstood older child with a bad attitude who is really just hurting inside due to his mom’s death. C’mon, you know you’ve seen versions of these same kids in several other movies. They both closely follow the blueprint here and everything from their actions to their relationships with their father seems really familiar. After Dylan is expelled from school and after seeing too many reminders of his wife around town, Benjamin buys and moves to a dilapidated old zoo just outside of the city. His hopes are to start a new adventure that will help both him and his children overcome the grief that they’re all still battling in their own ways. The zoo comes with it’s own assortment of exotic animals as well as a small staff that we hardly get to know with the exception of the head zookeeper Kelly (Scarlett Johannson). Young Rosie loves their new home while the rebellious Dylan wants to move back to the city. 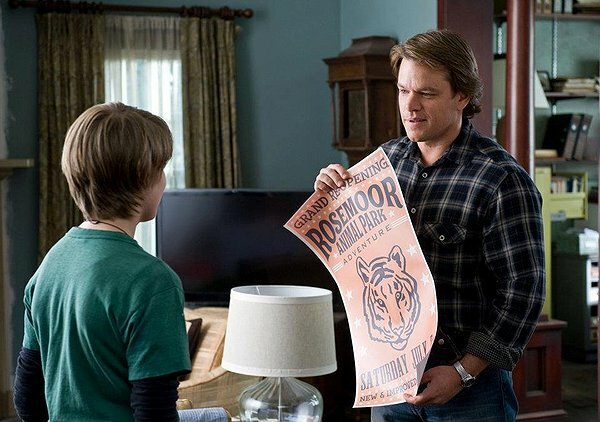 Against the advise of his older brother Duncan (Thomas Haden Church), Benjamin sets out to fix up the zoo in hopes of opening it up for the public. But as costs mount up and money runs out, he soon finds that his entire adventure may never get off the ground. As I alluded to earlier, Cameron Crowe milks emotion out of almost every plot point. There are occasions where it does work especially when the film deals with the more personal feelings of loss that each member of the family is dealing with. But Crowe drags these things out just a little to far. I’ll use the strained relationship between Benjamin and his son as an example. We know that a huge blow-up is coming before the relationship will ever be fixed but it feels like it’s never going to come. At over two hours long, Crowe could have trimmed a lot of fat off of the story and the movie would have been better for it. There are also underwritten relationships between Benjamin and Kelly as well as Dylan and a 13-year old home-schooled zoo restaurant employee that go nowhere. But there is a touching side story about a sick bengal tiger that Benjamin grows close to. In a sense it mirrors what he faced with his wife and it plays a big part in his personal healing process. It sounds like I’m being really hard on the movie and with good reason. But there is also some things to like. As I mentioned there are moments where the emotion feels genuine and I was stirred by them. And even though the family dynamic is something we’ve seen numerous times before, there were instances where they were a believable family struggling with an intense loss. The performances are generally good even though the material sometimes lets the actors down. And I also found that the true story vibe made the movie more interesting. It’s really a neat story. I just wish it had been constructed a little better. “We Bought a Zoo” isn’t a horrible movie but it’s one that could have been a lot better. It’s sloppy screenplay doesn’t help and the movie runs about 20 minutes too long. It advertises itself as a family picture but it deals with some fairly heavy subject matter and the inclusion of a few pointless vulgarities, especially from a young child, had me shaking my head. At it’s core, the movie has a really good story and we see glimpses of it in some of the scenes. Even with it’s faults, I stayed with the film to the end just to get the feel-good payoff it delivers. It’s just a shame that it couldn’t have maintained a more consistent story from start to finish. This entry was posted in Movie Reviews - W and tagged benjamin mee, colin ford, maggie elizabeth jones, matt damon, movie review, scarlett johansson, thomas haden church, zoo. Bookmark the permalink. Spot on with your views there Keith. I was a bit more scathing and went on a bit of a rant but if I’d kept my head, I’d liked to have written something similar to yours. I enjoyed your review though. I think we saw a lot of the same things in the movie. It’s an example of a film that could have (and should have) been better than it was. Missed opportunities. Thanks for great comments Mark! Your welcome mate. Yeah, We seemed to agree on the major faults of the film and Crowe’s forcefulness. If he’d had just stepped back a little and let the actors and story be more natural it would have worked better. Like you say, it was a good story. It was just delivered poorly. It really is a family movie, so I wasn’t expecting much of it. It plays it very safe and wasn’t very funny, but I didn’t mind watching it. I think you can make a great “family movie”. I think about last year’s “Hugo”. I loved that picture and had a great time watching it with my kiddos. In “Zoo” I was put off by some of the language (especially the “let’s let the cute little girl use a vulgarity” gimmick). It certainly wasn’t pervasive, but it also wasn’t something that I really wanted to rush my kids to see. I wasn’t all that interested in this even w/ all the animals 🙂 I didn’t know about the foul language here but that’ll put me off even more. I guess to be honest I need to clarify that the language isn’t pervasive. There are only a few instances of it but they really stand out and are completely pointless especially in a movie portraying itself as a family film. I’m also always turned off by forcing little children to utter profanity to try and be funny.